Should You Be Calling Yourself a Freelancer? As editors, we know that words matter. Yet how many of us have considered the import of calling ourselves freelancers instead of proprietors or business owners or something similar? What would you call yourself if not a freelance editor? How would you market yourself absent the word freelance? This isn’t an essay about what one should charge. What you should, want, or need to charge to make your editorial business sustainable may be different from what I should, want, or need to charge to make my proofreading business sustainable. Rather, I’m focusing on how even experienced editorial freelancers should regularly evaluate what they are charging and how they are determining the price for a job, and whether they should introduce new pricing models that could increase their income. We’re back in the world of testing. If you don’t know what you need to earn each fiscal year (required earnings) and you don’t know what you are earning each fiscal year and how many hours you are working to achieve this income (actual earnings), you can’t evaluate whether your business is profitable or unprofitable, nor whether it is in financial growth, stagnation, or decline. And if you can’t evaluate the health of your editorial business, you won’t be able to evaluate the impact of introducing new pricing models, new services, new working-week regimes…new anything, in fact! Data tracking doesn’t have to be complicated. I use an Excel spreadsheet to track my work schedule and earnings (a very basic template, which you can adapt for your own purposes, is available on The Proofreader’s Parlour at “Editorial Annual Accounts Template (Excel)”). Each line in my annual spreadsheet tells me the name of the client, the client type, the title of the project, the word count, the price charged, the time taken to complete the job, the dates for arrival and completion, an invoice number, the number of words per proofread per hour, and £ per hour earned. At the end of the year, I can see at a glance my total earnings, my average billable hourly rate, and my average billable rate per 1,000 words. I like to record previous years’ totals on my current spreadsheet so that I can make quick annual comparisons. In this way, I have a macro view of my business. I can also look at micro issues including, but not limited to, whether particular types of work are proving more lucrative than others (e.g., students vs. indie authors vs. publishers). I can see what’s working well and what’s working less well. That tells me how I might want to focus future marketing activities in order to expand the amount of work I do in the most profitable sectors. Importantly, I track all requests to quote, so I know how much work I turn down, refer, make an offer on, and whether those offers convert into bookings or are rejected by the client. I keep a spreadsheet on my mobile phone that logs all requests from new clients. This logs the type of client (e.g., student, agency, author, publisher), the date the request was received, the type of work (e.g., thesis, book, report), and my response (offer, referral, decline). If my offer converts into a booking or if the client declines my offer at a later date, I amend the spreadsheet. Requests to work for existing clients are logged in a separate file on my PC. All confirmed bookings are entered into my annual accounts spreadsheet. The data that you need to collect and evaluate will not necessarily be the same as the data that I need to collect and evaluate. One thing’s for sure, though – the more data you collect, the more insightful your conclusions will be. Even experienced editorial freelancers can fall into the trap of not testing different ways of pricing. When I set up my proofreading business, most of my work was for publishers. In the main, the publisher offered an hourly rate and a budgeted number of hours in which they expected the work to be completed. I would accept, negotiate, or decline. I became used to thinking in terms of hourly rates and this model was the one I used to build a price when I was quoting for other client types, even when I was in control of setting a price. So when a student asked me to proofread a thesis, I’d estimate (based on a sample) how many hours the job would take, and then multiply the figure by my self-determined hourly rate. There’s nothing wrong with this type of model. Many people prefer it and believe it to be the most profitable way of working. However, it is not the only option; and even if it is the most profitable way of working for person X, it may not be the most profitable way of working for you. Furthermore, different models may yield better returns depending on client type or editorial service. What is certain is that unless you test different pricing models, and record the data acquired during your tests, you won’t know whether model A or model B is your best choice. Here’s a breakdown of how I went about testing an alternative pricing structure. Note that my data tracking, reviewing, and testing decisions are particular to my business. I’m a proofreader who specializes in working on book-length projects for academics and independent authors. I sometimes work on postgraduate dissertations and theses, business reports, journal articles, and promotional material. In general, my proofreading service is fairly uniform in terms of what I’m required to do. Projects rarely overlap — it’s a case of project in, project out, move on. After several insightful discussions with a trusted colleague/friend who used a different pricing model to my hourly rate one, I decided to take another look at my data. First, I looked at my macro-level totals. These told me that my business was growing year on year. That’s all well and good, but what about the micro data? When I was offered an hourly rate by publishers, I earned less per hour on average for this client type than when I charged independent authors, students, and businesses a fee based on price per hour. Three publishers were outliers and were competitive with my other client types. Many publishers were offering uncompetitive (for me) rates, though they were low-risk clients — long-term customers who paid on time, offered regular work, and were thoroughly enjoyable to work with. I was turning down a lot of work from indie authors and students because there was no room in my schedule. Some of those slots were being taken up by the less-competitive but long-term, low-risk, much-loved publishers! You could build different arrays for different client types or different services. These would reflect the different demands of the work. Fundamentally, the array formula allows you to build economies of scale into a pricing structure. When I charged indie authors, students, and businesses on an hourly basis, I earned less on average than when I set the fee on a per 1,000 words basis. When I set my fees on a per 1,000 words basis, I earned more per hour from businesses than from students and indie authors. The business projects tended to be much shorter in length. Therefore, the total earnings per project were higher when I worked with indie authors and students. All of the businesses wanted a fast turnaround, which incurred a premium rate (hence the higher per-hour earnings mentioned above) because of the out-of-hours nature of the work. I’ve whittled down my publishers to a those few whose rates are competitive with my other clients. That meant saying goodbye to some long-term clients whom I had very much enjoyed working with. I’ve increased my promotion focus on the student and independent-author markets. I now favor a price per 1,000 words model (there are exceptions) over a per-hour model. Fast-turnaround work for businesses on a per 1,000 words basis is very lucrative but rarely fits comfortably into my standard proofreading schedule because of the large amount of book projects I am commissioned to work on (especially fiction). I prefer not to work out of hours so I’ve increased my out-of-hours premium levies (from double to triple) to reflect this position. If I’d not recorded and evaluated my data, I would not have been able to evaluate the then current state of my business and identify opportunities for potential growth. Following on from that, I’d not have been able to take actions (e.g., the pricing-model test) that would affect the future state of my business. In my case, it’s not just the change in pricing model that impacted on the increase in my average billable hourly rate; looking at the micro elements of my work schedule and accounting information helped me to fine-tune my existing client base (e.g., publishers aren’t out of the mix — I do still accept work from a small number of competitive presses, even though they set the fees and even though these fees are based on hourly budgets; and my out-of-hours premium rates have increased). Owning an editorial business means you have choice — choice about what to charge and how to charge, and choice about what to accept, negotiate on, or decline. What works for your colleague may be less fruitful for you. Some pricing models may work better for particular client types. And different types of editorial service may favor different fee structures. When it comes to pricing, what you know is as important as what you charge. If you are basing your fee structure on untested assumptions, you may not be getting the best out of your editorial business. I’d recommend that we all regularly look at our work schedules and accounts in detail, evaluating the data at micro and macro levels. We should ask ourselves whether there’s room for improvement and consider testing new models (pricing, of course, isn’t the only thing we can test). In this way, we can make evidence-based decisions about how to charge, where to target our marketing, and which clients to say goodbye to and which to retain. I love a list! Recording the stuff I need to do helps me to organize my thoughts and steers me away from procrastination and toward action. So what follows is by no means a call for the abandonment of the to-do list. New starters and old hands alike can benefit from a list of actionable points. Caution is required, though. The to-do list does have the potential to encourage linear thinking, and this can be a hindrance when it comes to the business of proofreading (or any other type of editorial service for that matter). Linear thinking can lead one down a road of focusing too heavily on one part of our business in the belief that if we get X just right everything else will fall into place, or that X is more important than Y and therefore must be completed in full before Y is considered. Interconnected thinking (I call this joined-up thinking elsewhere), on the other hand, recognizes that X impacts on Y, which impacts on Z, and that, together, X, Y, and Z drive success. In this essay, I’ll look at the interconnectedness of our business practices, and the time it takes to build connections. Isabel is in the process of setting up a proofreading business. She’s completed a comprehensive training course followed by mentoring. She’s confident in her skills and believes that she’s fit for the purpose. And she is – from a technical point of view. She has a potential problem, however. She’s been so focused on her training that she’s not spent any time considering how she’ll make herself visible to paying clients. Training was at the top of her list – and while this is certainly no bad thing to be at the top of any freelance business owner’s list, focusing on this alone will not bring in paying work. Create work schedule to track jobs, payments, time, etc. I’m a firm believer that Isabel would benefit from looking at her proofreading business in a different way. What if, instead, she visualized it as a wheel rather than a list? I’ve regularly promoted this approach specifically in relation to editorial marketing (see, for example, “The Marketing Wheel – Visualizing Your Editorial Business’s Promotion Strategy,” Proofreader’s Parlour, January 2016), but it’s a useful tool for thinking more broadly about editorial business practice. 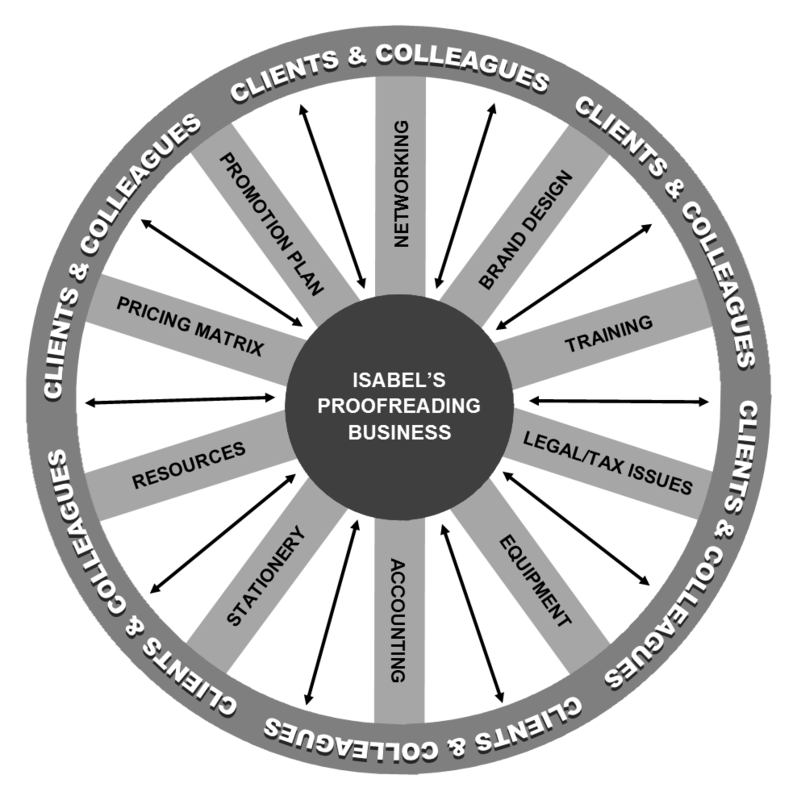 Both the list and the wheel address the same issues, but the wheel has the advantage of helping Isabel to visualize the interconnectedness of the various aspects of her business development. Let’s consider Isabel’s training in relation to other aspects of business development. Training provides her with skills. But it’s also a valuable message that she could use in her promotion materials, and that will make her more interesting to potential clients. Her qualifications include rich keywords that potential clients will use when searching online for people with her skills, so there will be SEO benefits, which will enhance her discoverability further. Her training program has also instilled in her a desire to provide proofreading work of the highest quality, and these high standards mean those new clients who discover her will be more likely to retain her and recommend her, thus leading in the longer term to a more consistent work flow and income stream. This will give her greater choice as to the work she accepts and the prices she can charge. Training has also contributed heavily towards her application for a higher-level tier of membership in her national editorial society, and this membership tier will provide her with the right to take an entry in its online directory. She can link her new website to this directory, so that’s increased professional credibility, SEO and visibility. The training organization she used might be interested in featuring a guest article that she could write about her experiences. This will add to her professional credibility, and will provide her with an opportunity to create inbound and outbound links between her website and the training organization’s website. The organization has a large following on Twitter, LinkedIn, and Facebook. It will share a link to her guest article with its followers. Some of its followers will link with Isabel, thus expanding her own professional community. That’s training, professional credibility, brand enhancement, business networking, SEO, and social media engagement in one fell swoop. I could go on, but I expect you get the point. Training isn’t something you do before marketing. Rather, it’s connected to marketing. They are but two spokes on a wheel and they link the hub (the business) to the rim (clients). Training gives substance to the marketing message. Marketing generates visibility and, therefore, new clients. New clients become regular clients because of the standards embedded by training. And up and down the spokes and round the rim we go. We might carry out a similar exercise when considering the links between pricing, an accounting schedule and stationery; or resource creation and business promotion; or brand design, accounting and stationery. Developing a successful proofreading business doesn’t happen overnight. No matter how good your skills, how creative your marketing, how professional your practice, it takes time to become so discoverable that you’re never without work offers; it takes time to build a list of regular clients who trust your skills and judgment so that they return to you time and again. And, even then, you can’t sit on your laurels because our industry, broad as it is, is always changing. What your clients wanted 5 years ago may not be what they want next year (consider, for example, the number of publishers who now require PDF markup). What your clients were paying 5 years ago may not be what they are paying this year (you may be worse off in real terms). The types of clients who were using people like you 5 years ago may have become more varied as of today (consider the expansion of the self-publishing market). The software or hardware you used 5 years ago might no longer be fit for the purpose or compatible with what your current potential clients are using and expect you to use. Two companies you worked for 5 years ago might merge tomorrow; or one might acquire the another. This could reduce the number of editorial freelancers hired, and you could end up on the cut list. The publisher you work with directly today might outsource its proofreading and editing to a packager in 2 years’ time. That could affect the rate you are paid and even the security of your freelancing relationship. This means that, as business owners, we need to be keeping our ear to the ground so that change is something we embrace, not resent, and something we view as providing opportunity, not marginalization. When we own our own businesses, we don’t have the luxury of spending time on blaming a lack of success on others who are now doing things in ways that don’t suit us. We’re not entitled to be paid X by a publisher whose profit margins may be being squeezed its own customers (consider, for example, the impact of university library budget cuts on academic publishers in the past two decades); we’re not entitled to work on paper because that’s the way we prefer it (for example, most independent authors want us to work in Word or on PDF). Instead, we have to invest in what makes us interesting and discoverable to those we want to work for and who will pay us what we want/need to earn if our businesses are to be profitable. Whether that means acquiring new skills, learning how to use new tools, changing the way we do our tax returns, targeting new client types, replacing old equipment, or testing and evaluating new and innovative marketing activities that increase customer engagement, the responsibility lies with us, and us alone. Furthermore, we may not see the fruits of our labor for months, even years. None of us can say how long it will take for an individual’s marketing strategy to put them on pages 1–3 of Google. None of us can predict whether a favorite publisher client will merge with another press and freeze its freelance rates. None of us can know whether the skill we learned back in 2008 will still be relevant in 2020 (proofreading on paper? Are you mad?). I do know one thing, though. There are no shortcuts — building an editorial business takes time and effort (and even courage when we are pushed out of our comfort zone). Taking the short view leads to disappointment and stagnancy: disappointment that the creation of a website alone didn’t generate 50 new leads a month — only 2 eight weeks after launch — or that the client you’ve worked for almost solidly for 6 years is now squeezing 200 additional words on a page but still paying you the same page rate; and stagnancy because you didn’t keep up to date with new developments and are no longer able to compete with colleagues who are providing a service that you consider unusual but that they consider run-of-the-mill (editing and proofreading onscreen might be a current example). First, you may be the type of person who is perfectly capable of looking at a list without feeling compelled to move through it only from top to bottom. In that case, list away! However, if you think that your to-do list is leading you into a mode of thinking that ignores the connections between the various aspects of running your business, try redrawing it as a wheel. It may be just the ticket to seeing your editing or proofreading business in a whole new interconnected light – and focusing your energy accordingly. Second, be realistic about the time it will take to build your editorial business. The hard work you put in at the beginning will not generate immediate results. Taking the long view will keep you on your toes and prevent disappointment and stagnation. Is it better to be a specialist or a generalist? This question often arises in editorial freelancing circles. Actually, answering it isn’t straightforward because it depends on how one defines those terms. One of my colleagues considers herself a specialist. She’s an editor who works solely with independent fiction authors, particularly in the field of speculative fiction. She doesn’t proofread. She doesn’t work for publishers, businesses, students, charities, project management companies, marketing communications agencies, or schools. I’m a proofreader who works with publishers, independent authors, businesses, project management companies, and students. My focus is on the social sciences, commercial nonfiction, and fiction. My colleague could be forgiven for thinking I’m a generalist because when you compare her range of clients (and the type of material she works on) with my range of clients (and the type(s) of material I work on), we’re worlds apart. However, I still think I’m a specialist because I don’t provide developmental editing or copy-editing services, and I don’t work on, for example, STEM (science, technology, engineering, and medicine) material. When I promote myself to potential clients, I present myself as a specialist. In fact, it doesn’t matter whether my colleague, you, or I think I’m a specialist or a generalist. All that matters is that potential clients who are searching for someone to solve their editorial problems can find me and recognize my ability to help them. Imagine the following scenario. Gandalf is looking for someone to proofread an article he’s submitting to the Journal of Ethical Wizardry. His paper compares ten different countries’ legal instruments for controlling spell-making and spell-casting. It’s already been peer-reviewed by some other eminent wizards. Now he needs to get it checked to ensure that the grammar, spelling, punctuation, and consistency are in order. The references also need checking to ensure that they comply with The Sorcerer’s Bluebook, which is the definitive international style guide for magico-legal citation. He searches an online directory for proofreaders and takes a look at the first three profiles in the list. Who will he pick? The proofreader who tells him she “proofreads anything”? The proofreader who tells him she has a politics degree and specializes in working with academics, publishers, project management agencies, and students working in the social sciences, with a particular focus on economics, politics, philosophy, international relations, development studies, and magic? The proofreader and editor whose website tells him she is a former practicing lawyer who now specializes in working with academics, publishers, project management agencies, and students working in the social sciences, with a particular focus on economics, politics, philosophy, international relations, law and criminology, development studies, and magic? Let’s assume that all three of the above proofreaders are experienced, well qualified, and members of national industry-recognized editorial associations. If I were Gandalf, my first choice would be the third person in the above list because she has specialist legal experience (though I would also bookmark the entry for the second person as a fallback). It doesn’t matter that she offers two different types of editorial service, or that she works on many different subjects, or that her client base is wide ranging. Sure, some might consider her a generalist. However, even if you do consider her to be a generalist, the fact is this – she’s more likely to spot a citation that isn’t formatted in the style recommended by The Sorcerer’s Bluebook, and Gandalf knows this. When we market ourselves as generalists, we run the risk of saying nothing. When we market ourselves as specialists – even if those specialisms are many and cover a wide range of subjects/genres – we can say a lot. It’s not believable: Specializing is about being believable. If you don’t inspire trust in a potential client at the first point of contact, you’re unlikely to be hired by anyone with even a grain of an idea in their head about what their chosen proofreader or editor might look like. Think about it – who really can proofread anything? I’m comfortable tackling a lot of subjects, but veterinary medicine isn’t one of them. Nor is electrical engineering. Nor is cardiopulmonary medicine. And if you’re an editor who does feel comfortable working in any of those fields, how do you feel about tackling the third draft of a self-publisher’s YA fiction thriller that needs a substantive edit? I suspect that editorial professionals who can truly proofread or edit absolutely anything are few and far between. SEO fail: Specializing is about being discoverable. If you don’t take the time to tell your potential clients what you specialize in, whether it’s one subject or twenty, your website will be less about SEO (search engine optimization) and more about SEI (search engine invisibility). When the search engines crawl over your website looking for keywords by which to rank you, they won’t find much and they’ll move on. Does that matter? After all, you proofread anything. That’s fine if your clients are searching for someone who does “anything.” In reality, many clients are more specific. Looking at my Google Analytics data, I can see that keyword searches include “academic editing,” “fiction proofreader,” “dissertation proofreading services,” “proofreading thesis Norwich,” “student proofreading,” “novel proofreading,” “PhD proofreading UK,” “medical proofreader England,” “academic copy editor,” “medical proofreading,” “scientific paper editing,” “CV proofreading,” “legal proofreading,” “self-publisher proof-reading,” “proof read my thriller,” and “proofread journal paper politics.” Given that I do provide services that match many of those keyword searches, I want Google to know that and rank me accordingly. Customer disengagement: Specializing is about being interesting. Saying you do “anything” is far less interesting than saying you do “X, Y, and Z.” When we tell a client about our specialist areas, we are demonstrating competence, experience, and knowledge. Imagine I send a letter to a scientific publisher. I’m one of five proofreaders who, that week, have contacted the book production manager with a request to be added to the publisher’s bank of proofreaders. In their cover letters, two of my colleagues have explained that they are specialists in academic proofreading; the other two have stated that they specialize in working with scientific academic material. In my cover letter, I tell the production manager that I’m a generalist and will proofread anything. Who makes the deepest impression on the production manager? I suspect that I’m bottom of the pile in terms of client engagement. I’ve not presented myself in a way that shows I’m interested in what the press publishes. Nor have I presented myself in a way that shows I’m interesting. Again, whether you work on one subject, with one type of client type, on one type of file, or you work on numerous subjects, with several different client types, in multiple media, present your narrow focus or your breadth of service in a way that marks you as a specialist. I always recommend specialization before diversification to new starters. Especially at the beginning of your career, thinking like a specialist helps you to plan your client-building strategy in a targeted manner and focus your marketing efforts on the type of clients who are most likely to give you valuable first gigs that enable you to build your portfolio and gather testimonials. For example, if you have a degree in electrical engineering, and you identify yourself as a specialist technical copyeditor, you’re more likely to be successful in securing your first paying job if you contact publishers with technical and engineering lists. Engineering students are more likely to be interested in asking you to check their Master’s dissertations and doctoral theses. Engineering businesses are more likely to ask you to edit their annual reports. Your specialist knowledge will count for a great deal, even though your editorial portfolio will be scant. When I entered the field of editorial freelancing, I deliberately targeted social science presses because of my politics degree and previous career with an academic publisher, marketing social science journals. I was able to present myself as a specialist proofreader who understood the language of the social sciences. Those factors made me interesting to those presses and gave them confidence in my ability to work with the subject matter. Of course, that doesn’t mean you can’t expand your specialist areas, or that you have to decline work that comes your way if it falls outside them (as long as you are comfortable with what you are being asked to do). My current portfolio is far more diverse than it was back in 2006. Specializing, however, made it much easier to get my foot in the door and build my business. Some of us choose to specialize in very narrow terms. Some of us choose breadth. One isn’t “better” than the other. Rather, it’s a business decision. If you prefer to offer a range of services to a range of clients over a range of media, and you can do this in a way that makes your business profitable, then breadth is better for you. If, on the other hand, you prefer to focus on one or two services to one client type over one medium, and you can do this in a way that makes your business profitable, then a narrow focus is “better” for you. Effective marketing will be key to whichever path you choose. If your preferred clients can’t find you, it matters little whether your client focus is narrow or broad – if you’re not discoverable, you’ll be unemployed either way. When it comes to marketing communications, there’s no such thing as a generalist. Rather, there are two types of specialist – the specialist-specialist and the generalist-specialist. Either way, both are specialists and talk like specialists. Even if you are, for all intents and purposes, quite the generalist – that is, you’ll edit and/or proofread a wide range of subjects for a wide range of clients – market yourself as a specialist. Relevant training (e.g., as a proofreader), related career experience (e.g., you used to be a social worker), and educational qualifications in pertinent a subject (e.g., you have a degree in public policy and administration). Industry-specific knowledge – you might be familiar with particular citation systems (e.g., OSCOLA for legal works), style guides (e.g., The Chicago Manual of Style or New Hart’s Rules), markup language (e.g., the British Standards Institution’s BS:5261C). Subject matter (e.g., sciences, social sciences, medicine, fiction). Client base (e.g., students, businesses, publishers, independent authors, academics). Editorial service (e.g., proofreading, copyediting, indexing, consultancy). Clear statements of interest: for example, “…I specialize in providing proofreading solutions for clients working in the social sciences, humanities, fiction and commercial non-fiction…” (Louise Harnby | Proofreader, England); “…We are a group of highly skilled and experienced editors who specialize in editing nonfiction…” (Freelance Editorial Services, USA); “…I specialise in fiction editing, especially for independent/self-publishing writers…” (Averill Buchanan | Editor & Publishing Consultant, Ireland); “…I offer specialist legal editing services for publishers, law firms, businesses, academics, and students…” (Janet MacMillan | Wordsmith | Editor | Proofreader | Researcher, Canada). Being a specialist is certainly about the choices you make as an editorial business owner in terms of the kind of work you choose to do. But it’s just as much about communicating with potential clients in a way that demonstrates enthusiasm, knowledge, skills and experience — even if you are a bit of a generalist! In this two-part essay, I consider how offering relevant additional services to existing clients can increase the editorial freelancer’s income-per-client in a framework of high-quality customer care. In Part I, I defined up-selling and cross-selling, discussed why these strategies are key to an effective marketing strategy, and tackled freelancer fears of appearing sleazy when offering add-on services that haven’t been directly requested. Part II considers how the editorial freelancer might create relevant up-/cross-selling bundles that are “wins” for both parties. I also offer a short case study on how I up-sold my proofreading service to an existing client — a bundle that was affordable and valuable to him, and profitable for me. Up-/cross-selling needs to make both parties feel like they’re winners. The editorial freelancer’s win: When considering, and costing, your up-/cross-selling bundles, consider the economies of scale you can bring to a project when you carry out different but related tasks, and how those might save you billable time. For example, if you offer a pre- and post-design proofreading bundle, the second pass will not take as long as it would have done if you had not worked on the raw text beforehand – possibly thousands of punctuation, spelling, grammar, and layout errors have already been attended to; you’ll already have built your style sheet; and you’ll be familiar with the content of the book, the author’s style of writing, and the way in which the book is structured. This means your bundle can be priced such that it is cheaper than if you had been commissioned to carry out both passes as independent projects. The client’s win: Even if budget is an issue for your client, this strategy could still be effective if the client feels they are going to gain from the proposition. In order to make a client feel that they are gaining something, the editorial service you up-/cross-sell must be relevant. This requires you to understand what the client wants. Since you already have your client’s attention (precisely because they are an existing client), you’re in the perfect position to have the conversation; then, from the information they share with you, you can assess how you might be able to offer additional solutions to their problems. Everyone loves a deal. If you’re asking your client to spend more with you, they may be more likely to agree if there is an incentive or reward. This doesn’t have to be monetary, but that is one obvious option. When the editorial freelancer finds a way to present an up-/cross-sell in a way that combines both relevance and a deal, the chance of acceptance increases (see “Selling more to existing customers,” The Marketing Donut). I’ve been working with a fabulous fiction self-publisher in the past year. He initially asked me to proofread in Word with Track Changes switched on. During an email conversation about his plans for publication, he told me that in addition to publishing his book on Kindle Direct Publishing, he also planned to produce a print version. As a gesture of customer care, I offered (free of charge) to help him source a professional typesetter; he thanked me for the offer but told me that he was confident in his design skills (acquired during his previous career) and would therefore be doing his own print layout. He also mentioned that he was glad of his skills because budget was an issue. Our conversation made me wonder whether there was a possibility of up-selling him an additional proofreading service that would be affordable for, and beneficial to, him ­— a service that was genuinely relevant, too, given that he’d commissioned only one pass of editorial assistance (proofreading) prior to the print formatting stage. Option 1: This option comprised several hours’ work on the prepublication typeset PDF, and was priced at a little over £100. I’d dedicate those hours to checking running heads, chapter drops, page numbering, facing recto and verso page balance, bad end-of-line word beaks, and consistency of layout regarding the different text elements; cross-checking the contents list and page numbers with the chapter pages; carrying out a spelling-error and -consistency check; and I’d run a macro to identify any potential confusables (see, for example, Louise Harnby, “Using proofreading macros: Highlighting confusables with CompareWordList,” Proofreader’s Parlour, 2016). Option 2: This involved all the work from Option 1, but also included a full proofread. The price was 40 percent cheaper than the first-pass proofread, but 2.8 times more expensive than Option 1. My client went for Option 2. Price-wise, it was far enough away from the original pass to make him feel that he was getting a great discount; value-wise it was much better than Option 1 because he was getting another full proofread to complement the first pass, plus all the layout checks. Physically, I was able to work through the designed book at a faster speed because I wasn’t having to make thousands of changes in the file. I’d already done all the hard work on that front. I’d created a style sheet during the first round of proofreading. In the second round, because all the build work was complete, it served simply as a useful reference tool for me. No creation work was required. This saved me more time. Finally, during the second pass, I wasn’t distracted by the engaging story line — I knew what was going to happen, so I was able to focus on ensuring that any final spelling, punctuation, grammar, and layout issues were attended to. All of that saved time enabled me to save my client money while still earning a comfortable and profitable hourly rate for myself. That made both of us happy. We’ve agreed that this will be our standard workflow for future books in the series — that’s important because it’s a demonstration of how the initial up-sell to an existing client can have long-term benefits for both parties. Ask yourself whether you’re taking advantage of opportunities to offer your clients additional services that will be of relevance and benefit to them. Then work out how you can introduce incentives to make your up-/cross-selling bundles more economically attractive. Relevant value-adding services that are profitable for you and affordable to your client are a win for both of you. Remember that securing additional work from existing clients is easier and cheaper than securing new work from potential clients. Existing clients have already made the leap from wondering whether they should work with you to actually hiring you. When you offer additional services that you consider to be relevant and beneficial to your client, you are not being sleazy; rather, “[t]he fact that you’re telling them about other useful products or services shows that you understand their needs and care about their satisfaction” (“Selling more to existing customers,” The Marketing Donut). In other words, you are providing high-quality customer service. Good customer service is good business practice because it makes customers happy. And, as we all know, happy customers are far more likely to retain your services and recommend you to their friends and colleagues. Part I defines up-selling and cross-selling, discusses the why these strategies are key to an effective marketing strategy, and tackles freelancer fears of appearing sleazy when offering add-on services that haven’t been directly requested. In Part II, I consider how the editorial freelancer might create relevant up-/cross-selling bundles that are “wins” for both parties. I’ll also offer a short case study on how I up-sold my proofreading service to an existing client — a bundle that was affordable and valuable to him, and profitable for me. In a recent thread in the Editors’ Association of Earth Facebook group (to join, visit the EAE group page), an experienced editor/publisher wisely raised the issue of up-/cross-selling to existing clients. Before we consider why this is such an important part of a marketing strategy, let’s clarify our terminology. Up-selling: this is a strategy for selling enhanced or add-on features to an existing service or product line. For example, you’re a specialist proofreader and have been hired to proofread the raw text in Word for a client. You accept the commission and you offer a post-design proofread on page proofs for an additional fee. This will act as a second pass on the text but will also include a range of layout checks (see Louise Harnby, “Not All Proofreading Is the Same: Part I — Working with Page Proofs,” Proofreader’s Parlour, 2014). Cross-selling: this is a strategy for selling different services or products, usually related to the one the client has already bought. For example, you run an editorial business that offers structural editing, copy-editing, proofreading, and formatting. You’ve been hired to copy-edit a manuscript for a self-publishing fiction author. You accept the commission, and you offer to design a professional print-ready layout of the text for an additional fee. You help your client to feel happy — like you’ve scored them a win — and that happiness deepens the relationship between the two of you. Deeper relationships mean higher retention rates (Len Markidan, “How to Use Upselling to Increase Customer Happiness, Retention and Revenue,” GrooveHQ, 2014). Selling to existing customers is easier. Todd Berkowitz argues that revenue increases of up to 20 percent are possible. “When study after study shows that it’s easier and cheaper to sell to existing customers than to try to acquire new ones, and loyal, happy customers are key to influencing prospects, provider marketers should be completely engaged in this effort” (“Why Companies Need to Market — and Not Just Sell — to Existing Customers,” Gartner, 2014). Markidan (cited above) concurs that it’s easier to market to existing clients, pointing out that it shouldn’t surprise us: “Wouldn’t we much rather buy from a company we already trust than one we’ve never done business with before?” If you still need convincing, here are some more interesting statistics: “The probability of selling to an existing customer is 60–70%. The probability of selling to a new prospect is 5–20%” (Colin Shaw, “15 Statistics That Should Change The Business World — But Haven’t,” citing Paul Farris’s Marketing Metrics). An initial up-/cross-sell to an existing client in respect of a current project can knock on to future commissions. That means both parties receive the gains across multiple projects — improving the customer-care experience from the client’s point of view while increasing income-per-client and reducing marketing time from the editorial freelancer’s. Some editorial business owners are reluctant to up-/cross-sell; they feel embarrassed about offering services that haven’t been directly requested by the client, and argue that, surely, the client already knows what he or she wants. I understand where this feeling comes from; Markidan sums up the problem succinctly: “For many of us, it might bring up images of sleazy salespeople trying to line their pockets by selling us extra stuff we don’t need” (“How to Use Upselling to Increase Customer Happiness, Retention and Revenue”). The client recognizes the problems, wants to find solutions, but is unaware of the extent to which you can help: Client A sourced you based on your copy-editing experience. They landed on your website and headed straight for the copy-editing tab to find out more about what you offer. However, later down the production line, they plan to source professional assistance with making their book Kindle-ready. You supply this service, but they don’t know this because they didn’t read that information on your website and they haven’t had a conversation with you about their publication plans. If you do have the conversation, it could provide an opportunity to offer a relevant cross-sell — one that the client already wants. The client is still mulling over the problems, but has yet to work out what solutions will be required, and therefore hasn’t considered the extent to which you can help: Client B sourced you based on your proofreading experience. You’re working in Word for them, but in the meantime they’re mulling over the fact that errors might be introduced at typesetting stage. You understand how to work with professionally published page proofs. They don’t know this because you haven’t had a conversation about their publication plans. If you do have the conversation, it could provide an opportunity to nudge the client towards a relevant up-sell (in the form of two proofreading passes) ­— one that demonstrates your expertise and understanding of the issues in question. The client doesn’t yet recognize all of the problems and so is unaware of the range of solutions you can offer: Client C sourced you based on your proofreading experience, though you copy-edit too. This is a first stab at self-publishing and there’s a steep learning curve. Unlike more experienced independent authors, they don’t understand the different levels of editing, nor how these might impact on the quality of the published book. They’ve asked you proofread the raw text in Word. Budget is less of an issue than knowledge. The quality of their book would be greatly enhanced if they considered commissioning a thorough copy-edit for the raw text, followed by a traditional post-design proofread. Having a conversation about this issue could provide an opportunity for a relevant cross-sell (the copy-edit) and a relevant up-sell (the post-design proofread). The key to overcoming fears of behaving inappropriately is to communicate with the client — to show them that you are engaged with their publishing journey and keen to explore the challenges and possible solutions. Those conversations will enable you to learn what your clients want and need, and whether there is an opportunity to offer appropriate additional services. In Part II, I consider how up-/cross-selling bundles benefit the existing client and the freelancer, and I offer a short case study on how I up-sold my proofreading service. I retrained as a proofreader in 2005. For more than a decade beforehand I’d worked in a professional publishing environment, specifically in the marketing department of two mainstream academic publishing houses with an international presence. I knew exactly what proofreading was, and what it wasn’t — or I thought I did. Only a few months into professional practice, my understanding of the skillset I’d chosen to specialize in was challenged. To this day, it is still being repeatedly challenged. Publishers’ expectations of what a proofread entails match my training and in-house experience, but students, schools, charities, businesses, and beginner-novelists seem to have very different ideas. The term proofreading, far from being straightforward, now appears rather more complicated. Indeed, how one defines proofreading isn’t determined by what one actually does, but rather by whom one talks to. National editorial societies tend towards offering definitions of proofreading that accord with publishers’ expectations. This is not surprising given that publishers provide thousands of professional proofreaders with regular work. So, if I want to be fit to proofread for this client type, I need to understand what this client type’s expectations are, and I expect any professional body representing me to provide guidance that reflects industry-recognized best practice. Below are excerpts from several national editorial societies’ online definitions of professional proofreading. Editors’ Association of Canada (Canada): “Reading proofs of edited manuscripts. Galley proofing may include incorporating and/or exercising discretion on author’s alterations; flagging locations of art and page references; verifying computer codes. Page proofing may include checking adherence to mock-up (rough paste-up), accuracy of running heads, folios and changes made to type in mock-up, checking page breaks and location of art, and inserting page numbers to table of contents and cross-references if necessary” (EAC, “Definitions of Editorial Skills”). Society for Editors and Proofreaders (UK): “After material has been copy-edited, the publisher sends it to a designer or typesetter. Their work is then displayed or printed, and that is the proof — proof that it is ready for publication. Proofreading is the quality check and tidy-up. However, some clients expect more than that. Many proofreaders find they spot more errors on paper than on screen, but proofs may be read and marked in either medium. Proofreading is now often ‘blind’ — the proof is read on its own merits, without seeing the edited version. A proofreader looks for consistency in usage and presentation, and accuracy in text, images and layout, but cannot be responsible for the author’s or copy-editor’s work” (SfEP, “What is proofreading?”). Editorial Freelancers Association (USA): “Comparing the latest stage of text with the preceding stage, marking discrepancies in text, and, when appropriate, checking for problems in page makeup, layout, color separation, or type. Proofreading may also include one or more of the following: checking proof against typesetting specifications; querying or correcting errors or inconsistencies that may have escaped an editor or writer; reading for typographical errors or for sense without reading against copy; verifying links in online publications” (EFA, “Proofreading”). Association of Freelance Editors, Proofreaders & Indexers (Ireland): “The proofreader reads page proofs after edited copy comes back from the typesetter or desk-top designer. The proofreader’s job is to make sure that text, illustrations, captions, headings, etc., are properly placed and complete; to check that design specifications have been followed; to check running heads; to ensure that captions and legends match artwork; to ensure that pagination matches the Contents list; to check end-of-line breaks; to proofread preliminary pages and end matter (e.g., the index if there is one); to fix incontestable errors of spelling, punctuation and grammar that have slipped through the net during copy-editing; and to query inconsistencies” (AFEPI, “What do proofreaders, editors and indexers do?”). These excerpts reflect very well the tasks required by the publishers and project-management agencies that procure my proofreading services. The emphasis is on the expectation that the proofreader will not be amending raw text, but will be annotating proof pages, post design, either in print or in digital format, usually using industry-recognized markup language. When it comes to working for publishers, the notion of proofreading is not tangled. Things start to get a little messy, however, when we branch out into the wider world. Some national editorial societies recognize that definitions of proofreading start to tangle when the proofreader’s client base extends beyond the publishing industry. See the SfEP, “What is proof-editing?,” for a brief but useful introduction to how a proofreader may be asked to work with raw text and intervene in a way that the publishing industry would define as light copy-editing (or another skillset). Of note here is that all of the above clients want the proofreader to edit the raw text directly. However, they also require a range of other tasks that, traditionally, fall well outside the proofreader’s remit — structural decisions, rewriting, text reduction, and layout and text styling. And, in the final case, the proofreader would be required to directly amend the text within a content management system. In fact, there’s nothing wrong at all with the proofreader carrying out these tasks as long as the proofreader feels competent to do so, and as long as the client and the proofreader have a mutual understanding of what can/can’t or will/won’t be done as part of the project. The point is, rather, that these tasks would be far less likely to be requested in a proofreading brief from a publisher. This is the tangled world of proofreading. I do accept that the extra-proofreading requirements identified above — amending raw text, taking structural decisions, rewriting, reducing the amount of content, layout and text styling tasks, and working directly in content management systems — are certainly not what most of us would consider proofreading. However, as business owners, we’re required to communicate with our clients in a way that makes them believe we can solve their problems. If I want to take on a proofreading commission that also involves styling the text in the Word file of an indie author’s book so that it’s ready for upload to Amazon’s Kindle Direct Publishing program, and I have the skill to do this, I’m not going to engage the client in a discussion over semantics. If I want the job, and I can do the job, I’ll quote for the job. If the client wants to call it proofreading, we’ll call it proofreading. In the nonpublishing world, definitions of proofreading are tangled, but I know this. What’s important is not that I quibble over the definition, but that I unpick the client’s request so that we are both clear about what is required. Definitions of proofreading may appear tangled to those of us within the editorial and publishing industries, but, to many nonpublishing types, things are rather less messy! You want the spelling, punctuation, and grammar sorted out? Call a proofreader. You want Kindle-ready formatting? Ask a proofreader. Is English your second language? A proofreader can tackle that for you. Is the bibliography in your thesis a disaster? A proofreader is just the ticket. Actually, sometimes we can help and sometimes we can’t. How far any proofreader is prepared to step outside of traditional publishing-industry definitions of proofreading will depend on the proofreader’s preferences, skills, experience, and level of confidence. But that doesn’t mean the proofreader has to stop calling herself a proofreader, especially if calling herself a proofreader is what makes her discoverable to her clients. If you want to be a proofreader, don’t assume there’s only one set of client expectations about what you will or won’t do, or what proofreading is or isn’t. In an international marketplace made up of numerous different clients with widely varying problems, you’ll always be required to spot spelling errors and incorrect punctuation. But there’s a raft of other tasks that you could be asked to undertake, too. Whether you accept the challenge will depend on what you are prepared and able to do, not what you call yourself. I’ve read plenty of convoluted and inaccessible definitions of marketing over the years, none of which would give confidence to a new entrant to the editorial field. I developed what I believe is an easier-to-understand definition of marketing, comprising only four words: being interesting and discoverable. Being discoverable is how you enable your clients to find you. Being interesting is how you make your customers want to hire you, and retain you, after they’ve found you. Someone who is interesting but undiscoverable will have no work because their potential clients don’t know they exist. Someone who is discoverable but uninteresting will have no work because their potential clients don’t care that they exist. Someone who has been discovered and hired in the past but failed to maintain that long-term discoverability and interestingness will have no work because they haven’t kept up to date with the requirements of the market – what their customers want and the latest platforms they are using to source their editorial freelancers. This essay focuses on the challenge that the editorial freelancer faces of being interesting in such a competitive market. (For more information about being both interesting and discoverable, see my book Marketing Your Editing and Proofreading Business). An identification of self-strengths (and weaknesses) is key to differentiating oneself and thus being interesting. An editorial freelancer may not have much experience of editorial work but this “weakness” can be ameliorated when she focuses a potential client’s attention on what she does know a lot about, and then targeting those clients who appreciate that knowledge and see it as part of a solution to the problems they have. When I first started thinking about going freelance, I had dreams of being paid to proofread books in the genres that I most often read for pleasure: crime, mystery, and sci-fi novels. I scouted the major UK publishers of these genres (paying particular attention to web pages that give advice to prospective freelance editors and proofreaders) and my worst suspicions were confirmed: the chance of me picking up work with no prior experience in the field was poor. It’s hardly surprising — many of us looking for trade publishing clients are attracted by the idea of being paid to read the works of our favorite authors (even if the fees on offer are not always competitive, and the definition of “proofreading” confounds those of us who have been professionally trained). The field is, thus, very competitive, and the publisher clients are very picky. Certainly this wouldn’t have precluded me from working for self-publishing authors writing in these genres, but I was a new starter back in 2006. The self-publishing market wasn’t as developed as it is now. But even if it had been, my website’s search engine optimization was so poor that it’s unlikely that I would have been discoverable to those clients. In the startup phase, I was building my business by going to clients, not expecting them to come to me. I needed to put my practical head on. What educational qualifications do I have? What work experience do I have? Do I have hobbies that make me an informal specialist in a particular field? Do I have domestic skills that give me particular strengths? Do I lack certain skills and thus have particular weaknesses? I have a degree in the politics. I’d spent three years in higher education, reading social science texts; I understood the way they were structured as well as the language and style of the books. This wouldn’t make me attractive to a fiction publishing client, but perhaps it would give me a chance with social science presses. If you have a scientific background, science, technical, engineering, and medical (STEM) publishers will be much more interested in you than me – indeed, many editors/proofreaders I know who are working in STEM have scientific qualifications of some type. If you have a legal qualification, consider focusing on legal societies, law and criminology publishers, and law students. In my article “Does Training Matter?”, several publishers commented on how much they valued their freelancers having knowledge of the subject matter in which they publish. So, selling your educational background is a critical marketing tool. It differentiates you, and differentiation is interesting to your clients. If you’re targeting publishing clients, and you’ve worked in publishing, make sure you use this as a key selling point. It shows that you understand the business of publishing: the importance of deadlines, the diplomacy involved in author liaison, the challenges that your in-house contacts will be facing, the standards required, and the financial margins they are working within. If you don’t have publishing experience, consider what work you have done and target clients who are publishing material in your field of expertise. If you’ve been a nurse, focus on clients with a strong nursing and allied health list; if you’ve been a social worker, initially target clients who are publishing in the areas of social work, social policy, and administration. A few years ago, I had a discussion with a new proofreader who wanted to get into fiction proofreading. He’d been a military police officer and a teacher prior to starting out on his freelance journey. My advice to him was to focus his marketing efforts on (a) publisher clients with lists in military security studies, political science, and international relations, as well as educational publishing houses, and (b) self-publishers writing military science fiction and alternative history. Using your previous career as a tool in your marketing arsenal is vital to helping you to stand out from the crowd. Hobbies are not to be ignored. Using them as a focus for your initial marketing strategy may well turn out to be fruitful. There are many independent and niche publishers who will be happier turning their manuscripts over to you if you can demonstrate a high level of knowledge in a niche area. One of my regular clients once asked me if I felt comfortable proofreading a book about baking. I’m not interested in cooking and don’t know a huge amount about the subject, and that makes me uninteresting to cookery publishers. We mutually agreed the project should go elsewhere – they needed someone who understood the catastrophe that might ensue if “3 tsp baking powder” had been typeset as “3 tbsp baking power”. The things that some people do in the home, and that may be considered simple to them, are highly prized by some clients. If you’re a fine cook, then search for those publishers with a strong list in food and cookery books. The same goes for gardening or do-it-yourself (DIY), just to give two examples. There are scores of books that are published in these fields, and taking some time to research those presses with relevant lists in any given area could help you to differentiate yourself from your colleagues. How likely are you to secure work from independent fiction authors who want to send you Word files if you still only copy-edit on paper? How likely are you to secure proofreading work from a business in another country if you don’t have the skills and equipment to annotate a PDF? How likely are you to continue securing work from publishers who want you to edit efficiently onscreen if you are unable to use their house macro suite or use a style palette to code the different elements of the text? How likely are you to retain work from clients who want you to use the latest edition of the Chicago Manual of Style (CMOS) when you insist on amending texts based on outdated usage preferences? Telling our potential clients upfront that we are fit for purpose to carry out editorial work according to present, rather than past, preferences is key to retaining interest. Your marketing materials should reflect your ability to use, with confidence, the likes of Word or InDesign, Acrobat Reader or PDF Xchange, macro suites, and consistency checkers. It’s not just about digital tools. Even tools that were in use 30 years ago have been updated. We need to ensure that our clients know that we have the access to the latest edition of relevant style manuals, dictionaries, and guidance on industry-recognized markup language, for example. The advice from the British Standards Institution on how to mark a proof with the instruction “delete and close up” is not the same as it was prior to 2005. And regarding publication of the 16th edition of CMOS, “In a return to the 14th edition of the manual, the generic term in a proper noun is uppercased if used in the plural (e.g., Fifty-Fifth and Fifty-Seventh Streets, the Thames and Mersey Rivers, the American and French Revolutions)” (CMOS, “Significant Rule Changes in The Chicago Manual of Style, 16th Edition”). Editorial preferences are not static. New tools and platform are developed. Keep up to date with these changes and use them as key selling points to retain interest. For example, consider listing on your website the resources and reference materials you consult. In that way, current clients are less likely to become past clients, and potential clients are more likely to become existing clients. Starting out as an editorial freelancer is all about focusing on what you already have that prospective clients will view as the wow factor. There’s no quick fix to building a strong client list – it takes time and hard work. Making the effort in the beginning to identify what makes you look different – interesting – will provide you with the foundation on which to build your business. As your experience increases, you will be in a stronger position to diversify your client portfolio.